Does anyone know the number and type of batteries required? Also, how long would the batteries last with this torch on full brightness? Any idea how it compares to some of the Deal Extreme bike friendly P7 ones? Does anyone know the number and type of batteries required?Also, how long … Does anyone know the number and type of batteries required?Also, how long would the batteries last with this torch on full brightness? The deal extreme lights that have set a bit of a benchmark for these tend to use the 18650 li-ion cells, but as they're not commonplace over here I'd expect these to take 3x AAA batteries. Can't knock lidl for these and its always nicer to buy things from shops to have in your hands straight away, but can't recommend the DX ones enough if you can handle a wait. Bought one this morning. It takes 4 AA batteries (4 Energizers are included). It doesn't say how long the burn time is. It has high, low and rave flashing mode. Seems pretty well put together too. It has high, low and rave flashing mode. Seems pretty well put together … It has high, low and rave flashing mode. Seems pretty well put together too. Seconding the build quality, very sturdy and I love the quick focusing ring it has. Looks like a giant version of the 3AAA one they had a few months back. Forgot my wallet this morning or would have bought one. I bought one this afternoon. My store only had three left so expectd stocks to vanish on this one. I like mine very much. One of the drqawbacks you some times get with cree torches is the tight beam. 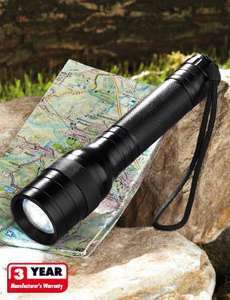 Great for distances but not great for looking for working in the dark. The beam can be adjusted to give a nice work beam width of around 6 to 8 feet. I just wish it was a smaller torch. This one is nearly as big as my 2d cell Maglite. The deal extreme lights that have set a bit of a benchmark for these tend … The deal extreme lights that have set a bit of a benchmark for these tend to use the 18650 li-ion cells, but as they're not commonplace over here I'd expect these to take 3x AAA batteries.Can't knock lidl for these and its always nicer to buy things from shops to have in your hands straight away, but can't recommend the DX ones enough if you can handle a wait. Bought this one today. It takes 4AA in a little holder, 2 rows of 2. It is quite a large light and the head is quite heavy. It's good but I'd prefer 2C tbh. Dont like the strobe mode either, pretty useless. Prefer the 3AAA one. imo if you have the 3AAA one and you're not that interested in a bigger torch avoid this one. I agree with you about the numbers of DX Cree led torches! I've got a few different ones for various tasks and always been pleased with them, for value, performance and build quality. I use the ones that use 18650 li-ion batteries that I also got from DX with a charger-much better and longer lasting that the equivalent AA or AAA packs some others use. plus numerous similar torches friends use that have all been impressive when compared with a standard traditional light like a Maglite, even the new led versions. Read online reviews and you will get a better picture. SKU 39585 is great, I use one for work.